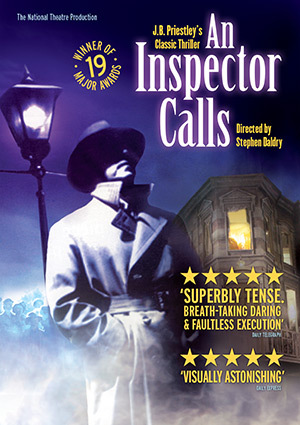 Review: An Inspector Calls. Nottingham Theatre Royal – East Midlands Theatre. 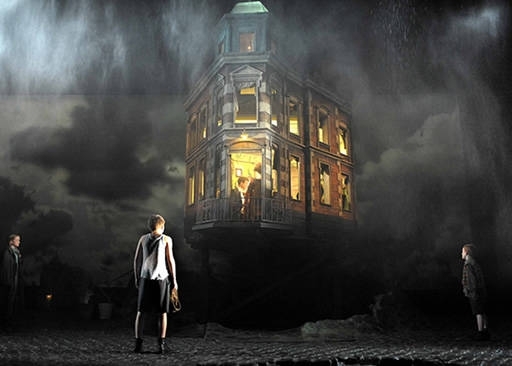 The Daily Telegraph once called this startling production of JB Priestley’s play An Inspector Calls ‘a work of great directorial daring, breath-taking visual invention and passionate moral urgency’. In this 2015/2016 National Theatre touring production directed by Stephen Daldry, currently playing at Nottingham Theatre Royal until Saturday 14th November, nothing has changed. It is easy to see why the classic thriller has become the winner of nineteen major international awards including four Tony Awards, three Olivier Awards, seven Drama Desk Awards, two Critics Circle Awards and two Evening Standard Awards. It is an epic amongst theatre productions, imaginatively staged full of raw emotion and enhanced by superb acting and a dramatic score. The gripping story finds an Inspector Goole arriving unexpectedly at the comfortable home of the well off Birling family. They are enjoying a dinner party and delighting in an engagement announcement in the family and the possibility of a business merge between Birling and Croft – two businesses that historically had been rivals. All seems well until Inspector Goole starts his investigations concerning the terrible death of a young woman called Eva Smith. It transpires that the deceased was known to the family but how well known is giving the game away. In the early part of the play Inspector Goole asks Mr Birling if the name Eva Smith means anything to him. She was one of his former employees who he falsely saw as a trouble maker and whom he sacked for asking for a pay rise. His uncaring response is “No… I seem to remember hearing that name somewhere. But it doesn’t convey anything to me and I don’t see where I come into this.” This answer forms the very morally corrupt essence of Priestly’s An Inspector Calls. Inspector Goole’s revelations topple the very foundations of the lives of the Birling family and the story of corruption and abuse causes the audience to examine their very own lives and consciences. The play was written at the end of the Second World War but is set in 1912. It explores, greed, hypocrisy, morality, terrible family secrets and their repercussions. The very impressive set is designed by Ian MacNeil. It features the Birling house (interior and exterior) in an often surprising way and at the beginning of the play we witness some young children playing on the rain soaked streets. The ‘house’ part of the set is as much a character as any of the human characters on stage and its visual interactions are spectacular. We also have a group of local people appearing throughout the play as witnesses to the unfolding action and none so poignantly as the group appearing out the mist in Inspector Goole’s last major speech. He talks about the world being a place where we are all intertwined in what we think and say and do. We are not alone. We are members of one body and we are responsible for each other. He concludes with “If men will not learn that lesson they will be taught it in blood and fire and anguish.” Considering the First World War is about to unfold only a few years later in this play Goole’s words are particularly apt as well as generally apposite. In this production we have Liam Brennan as an impressive Inspector Goole as eloquent in his silences as in his words. Tim Woodward is all bombast and denial as Mr Arthur Birling and he and Mrs Sybil Birling (Caroline Wildi) make a fine pair of arrogant Edwardians. Katherine Jack is an emotional tinderbox as daughter Sheila Birling and theatre graduate Hamish Riddle in his professional debut makes an excellent job as the alcohol driven and feckless Eric Birling. An Inspector Calls regular Diana Payne Myers is witty as house maid Edna and Matthew Douglas makes for a very credible Gerald Croft. An Inspector Calls runs without an interval and is one of the finest pieces of theatre to grace the Nottingham Theatre Royal stage this year. Definitely one to see. Review: A View From The Bridge. Nottingham New Theatre.